Every war reporter has them. Snapshots from the memory banks of horror, forever lurking and impossible to erase. Having covered conflict for the last thirty years, I have many of my own – people, places, smells and sounds. One memory, indelibly etched, is standing among the scattered limbs of the civilian victims after a suicide car bombing on the streets of Baquba in Iraq. More than anything though, what I remember most are the faces and voices of those caught up in battle. From Iraq, it might be the young American infantryman who told me how his buddy had just been blown to pieces by a roadside bomb. The National Theatre of Scotland’s production of Black Watch. Photo by Pavel Antonov. More recently, in Afghanistan, it was the confession of a young Scots marine, a sniper, who talked emotionally of how even his closest mates in civilian life could never grasp what he had gone through. But then just who, other than soldiers themselves, could ever be expected to understand such experiences? How many of us can honestly relate to what it must be like to watch a close friend die horribly in battle? Politics, the war on terror, making our country safe – for most soldiers, none of that matters half as much as camaraderie, staying alive and getting home. I first saw Black Watch not in Scotland, but in the United States. I had gone there to cover the U.S. premiere of the play in Los Angeles, and was to watch it in the company of three U.S. Army Iraq war veterans. For all four of us what we witnessed that night was a visceral and emotional return to some of the most haunting experiences of our own lives. It was a rare moment when art truly imitates life. 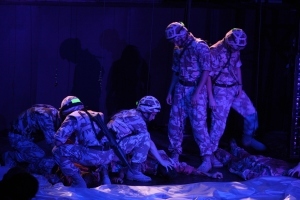 “I’d never have believed that something like art, and a play like this, could capture what it’s like being a soldier in Iraq,” one of the men told me afterwards. All three admitted having come expecting an anti-war play. What they got, they said, was a rollercoaster tale of esprit de corps that any soldier, anywhere, could identify with. To those of us outside this military fraternity, it’s all too easy to see those in uniform simply as heroes or villains. As is so often the case, the truth behind the soldier’s role, like the motives that take them to war zones in the first place, is often far more complex. Since that day in September 2001 when the twin towers buckled to the ground in New York, have we ever really paused to consider what impact the prosecution of the “war on terror” has had on a generation of our own young men and women who have served in Iraq and Afghanistan? Seeing Black Watch is to be reminded of the universality of the front line soldier’s experience. The boredom, the profanity and above all the black humour of a close-knit community. Today, as the war in Iraq still menaces ordinary people there, and that other conflict in Afghanistan touches us all in some way or other, Black Watch has more resonance and power than ever before. A bleak and unsettling theatrical experience it certainly can be. But above all else, Black Watch remains a profoundly uplifting reminder of the values of comradeship. David Pratt is an award-winning journalist, author and filmmaker. He has been a foreign correspondent for almost 30 years and covered wars across the globe including Bosnia, Afghanistan, Israel/Palestine, Iraq, Congo, Sudan and Somalia. He is a regular contributor to the BBC, and currently foreign editor of the Sunday Herald newspaper in Scotland.